In the aftermath of news that Cambridge Analytica illicitly collected data of 50 million Facebook users, anonymous, collaborative technology worker app Blind surveyed its users to see how many actually plan to delete their Facebook accounts because of it. The survey ran from March 20-24 and nearly a third (31%) of the more than 2,600 users who responded said, “yes,” they plan to delete Facebook. 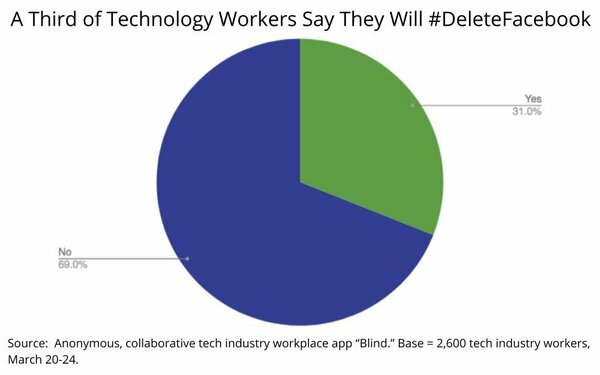 Breaking it down further, Blind found the percentages of tech workers planning to delete Facebook ran as high as 50% for Microsoft employees to a low of 2% for Facebook employees. 50% of Microsoft employees said they will delete Facebook. 46% of Snapchat employees said they would delete Facebook. 40% of Uber employees said they would delete Facebook. 38% of Google employees said they would delete Facebook. 34% of Amazon employees said they would delete Facebook. 2% of Facebook employees said they would delete Facebook. 1 comment about "A Third Of Tech Workers Plan To #DeleteFacebook". Carol Lewis from Riverton Media LLC, March 27, 2018 at 1:05 p.m. This is hilarious - Facebook is hardly alone! A lot of those cited will lose their jobs if the same scrutiny is put on their companies and, when the info is public, people start deleting them as a result.